In a previous post we mentioned the functionality of folding/murphy beds. In small spaces, if you can tuck away your bed your valuable floor space just opens up. In fact if you think about it, for two-thirds of the day your bedroom is not used and your most precious bed literally hogs up a crazy amount of space. 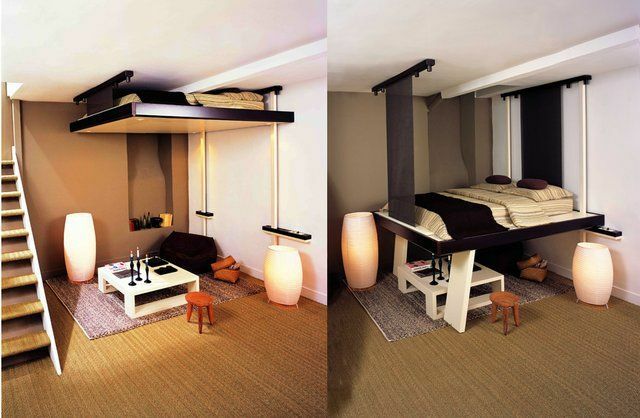 As mentioned we know we can fold up the bed, but you can also save space with retractable ceiling beds. The first thing that comes to mind regarding this system is whether it is actually sturdy and cost effective. We can imagine that such systems won’t come cheap but we do see a range of different systems that are eye-opening. Below is a picture of Madmen’s Vincent Kartheiser’s pulley bed. It’s manually operated and with high ceilings and an open floor plan, your eye is not immediately drawn to the volume of the bed. If you were wondering where the counterweight to the pulley was, it’s hidden in the wardrobe on the right. You can see more of the bed and his intentionally small home here. Kudos to him. So if pulling the bed down might be a tad too difficult, how about using a crank to lower it down? In the Silo House designed by Cornell University Students in the 2009 Solar DeCathlon, the visual lines of the bed are clean and when it’s down, it rests on slats that are actually doors for a cabinet below. It’s a pretty amazing feat of engineering indeed. 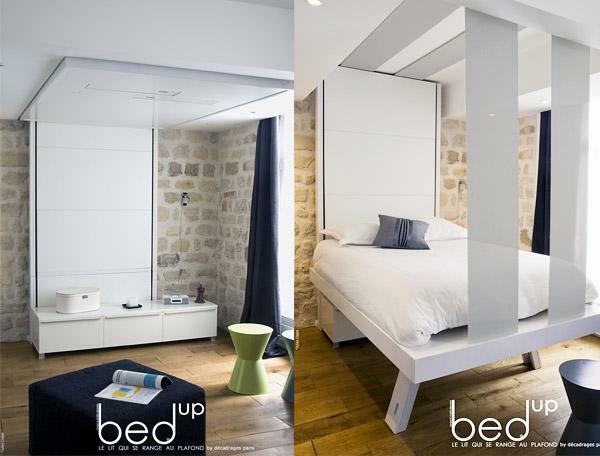 Bedup is a company that specializes in retractable ceiling beds and they make it somewhat more applicable to the masses. With LED lights on the bottom of the bed when it’s up, it solves the problem of lighting when it’s night time. As far as stability, there are two legs that pull down for the bed to rest on. The model below even hides the bed pretty flush with the ceiling, so you might not even notice it at all. Finally, the Spacedormer is quite similar to the Bedup except it doesn’t have the two vertical pulley ropes(not exactly sure what it is called). The mechanism looks quite smooth and user friendly and it looks like it was designed for the masses in mind. It’s definitely exciting to see such technology but the price tag built into such specialized beds could be on the high end. However, if many small apartments in Hong Kong were to implement such transformable measures, it definitely makes living in shoebox more comfortable. All great things start with concepts, if more people realize how life would be easier with such designs, maybe the cost of one of these things could go down.